How can I install and and launch Simulink Onramp? Simulink Onramp works with MATLAB R2018b. If you do not have it installed, download it here. In MATLAB, go to the directory where you downloaded the toolbox. In the MATLAB Current Folder window, right-click on the toolbox and select Install. 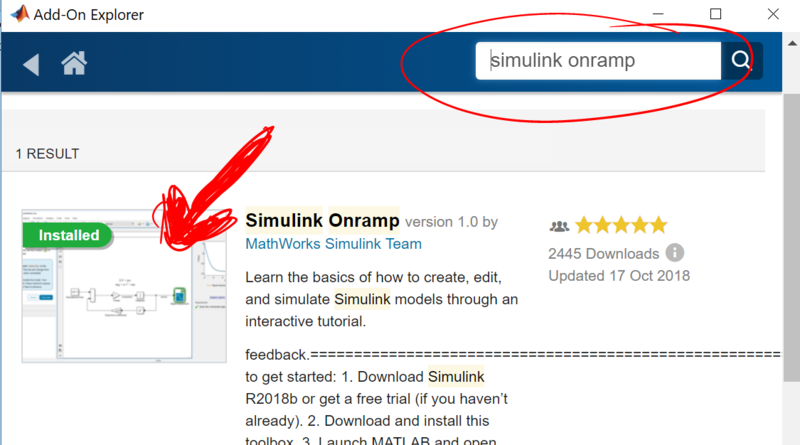 To launch Simulink Onramp, click on the Simulink icon in the Home tab of the MATLAB toolstrip to launcthe Simulink Start Page. After I install the Simulink Onramp, I can't the link to launch Simulink Onramp anywhere in the Start Page. This happened to me also. I had to close and relaunch Matlab and Simulink, and then it worked. Hope that fixes it for you. I restarted after installing the Simulink Addon, still I couldnt find the Simulink Onramp in the start page. 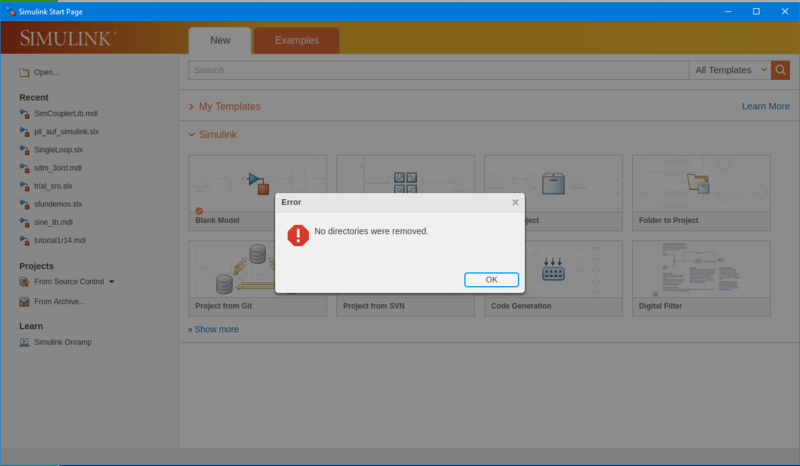 I can't see Simulink Onramp either, after several reinstallations and restarts of the program. i can't see this option neither what should i do? I use a mac. These instructions are no real help. I see nothing like .mltbx to choose. What file do I click on to start. Same here I do not see the onramp. Is it possible that it does not work on 2018a? After installing Simulink Onramp from the Add-On Explorer, I had no problem finding it in Simulink on my Mac, R2018b, High Sierra. Simulink Onramp is available for R2018b onwards only. i am also facing same problem. i could not find the Simulink On ramp on start page. i installed 2018b and its available now. Lesser version doesn't have. I have the simulink onramp on the start page. However, when I open it, it showed that 'Oops. 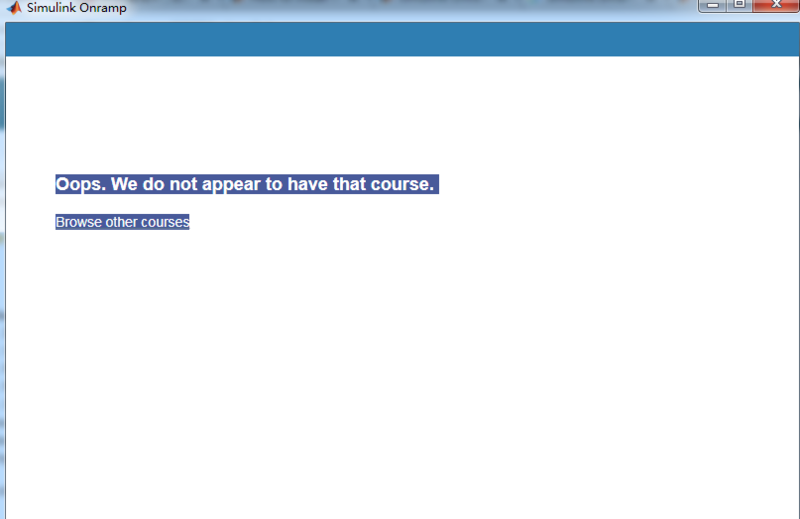 We do not appear to have that course.Browse other courses'. What's wrong with it? I'm a student and I have Matlab 2018b. Please help me! Could you please contact technical support and someone will help you? Does this work in Matlab Online R2018b? I can install the Onramp toolbox and see it in the Simulink Start Page, but when I click to launch it, it shortly shows "Busy" and then comes back with the error "No directories were removed" (see screenshot). This is hard to debug as it doesn't say where it wants to "remove directories" and why it can't do so. Any hint on where I have to look at? is simulink onramp available for R2018a? if no, then how i can i get simulink onramp for R2018a? SImulink Onramp was created for R2018b. You will probably need to upgrade if you want to use it. Iam using MATLAb Online R2019a and I installed the Simulink Onramp add-on. Even after installation, I do not see the Simulink icon on the toolstrip. Please help..